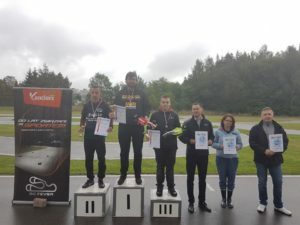 This weekend (2nd-3rd September 2017) our drivers have competed in National Championship Finals in Ruda Śląska. 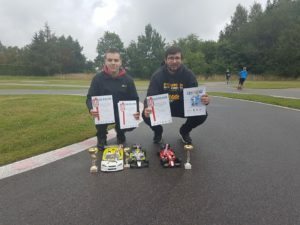 In formula class Patryk Jeż took the 1st place and Krystian Kopacki was 3rd. In general classification situation looks the same. Patryk is Polish National Champion and Krystian is 3rd. This round was decisive for overal classification. Who win the event, win national championship. In first qualification the most consistent and fastest driver was Patryk. In second better was Krystian. Third went to Piotr Okoński, but Patryk grabbed TQ overnight. 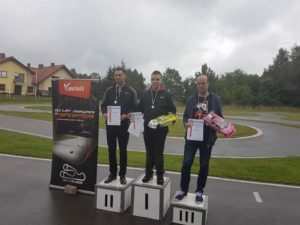 In TC Stock 17,5 Krystian won event and in general he is Polish National Champion. Krystian was the fastest in every qualification heat and without any problem he took the TQ. Unfortunately on Sunday weather was very bad. Final runs were canceled due to rain, despite that conditions were really hard. Very small grip and bumpy track were the biggest challenge, but our boys showed that it wasn’t a the problem for them!